There have been debates since the announcement of Pep Guardiola about whether Joe Hart would suit his style of play. England’s number one is a high-quality goalkeeper, but two of his weaknesses – footwork and distribution – are skills the highly demanding Guardiola likes his goalkeepers to excel at. Recent indications have been that City will bring in competition for 29-year-old Hart, but the quality of the names linked has varied. From Víctor Valdés, a declining goalkeeper who has now joined Middlesbrough, to Marc-André ter Stegen, one of the best emerging goalkeepers on the continent. City are said to be close to finally signing 24-year-old Gerónimo Rulli, a goalkeeper on the cusp of breaking into the Argentine national team, but the latest reports from Spain are that he will be immediately loaned to Real Sociedad, where he played last season. This would mean Pep Guardiola retains faith in Willy Caballero, who has seemed a certain casualty of this summer’s overhaul, or sign a second goalkeeper. According to Barcelona-based daily sports newspaper Mundo Deportivo, that may well be the plan. 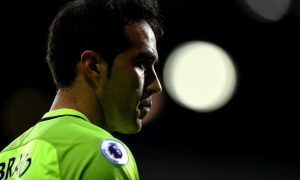 City are admirers of Barcelona’s Ter Stegen, but it is the man he jostles for the gloves with, Claudio Bravo, who is in City’s sights. Though he is Barca’s first-choice goalkeeper, at the age of 33 and with Ter Stegen wanting more than just cup games, he is seen as the more accessible signing of the two. Mundo Deportivo claims that yesterday in San Sebastián, there was much talk of Bravo joining City and their own information is that the Chilean shot-stopper could be presented as a Manchester City player next week. However, Barcelona claim to know nothing of interest because Bravo hasn’t spoken to them about joining another club. Barca are calm, say Mundo Deportivo, but admit there is a possibility because they know City are looking for a goalkeeper who can use his feet better than Hart – and the belief is that Barcelona have two of them. Should Bravo arrive at the Etihad Stadium, Joe Hart would be in for the fight of his life. Pantilimon and Willy offered very little competition, but Bravo has been Barcelona’s first-choice goalkeeper for the past two seasons, and knows exactly how to play in a system like that of Pep Guardiola’s.